The second gallery in Madrid's 'golden triangle' of art museums is the Museo Thyssen-Bornemisza. 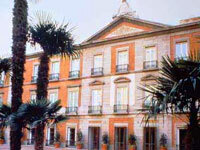 Housing the former private collection of the Thyssen family, the works were bought by the city of Madrid to enrich its impressive collection of art treasures. The collection, housed in the restored 18th-century Palacio de Villahermosa near the Prado, contains more than 800 paintings, sculptures, carvings and tapestries, ranging from primitive Flemish works to contemporary pieces. Among the highlights are works by Renoir, Durer and Van Eyck, but many masters are represented in the Thyssen, including Claude Monet, John Sargent Singer, Vincent Van Gogh, Henri Matisse and Edvard Munch. The collection includes some major American works as well. There is a great gift shop and a cafe at the museum. Guided group tours with experts are available both during opening hours and when the museum is closed, but these must be booked in advance. The museum also hosts lectures, workshops, courses, concerts and all sorts of other events and activities - check the official website for details. For many people, the Thyssen is the favourite of the three famous Madrid galleries due to its compact nature, variety, attractive building, and atmosphere. It is also usually the least crowded of the three major galleries. Address: Villahermosa Palace, 8 Paseo del Prado. Transport: Metro to Banco de Espana station. A variety of public buses also provide transport to the museum. Opening times: Tuesday to Sunday 10am to 7pm. Free access on Mondays between 12pm and 4pm. Admission: €9 (general); €6 (reduced). Temporary exhibitions vary in cost.